Is it snowing in Montecampione ?¡Gracias! Montecampione in Italy (in the Lombardia region) is a large resort with 11 lifts (8 chair lifts, 3 surface lifts) that offers skiers an impressive 728 metres (2388 feet) of vertical descent. 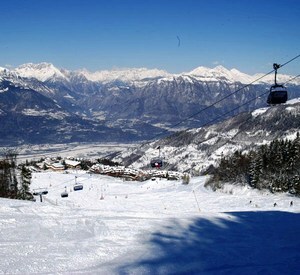 Montecampione has 20 pistes with a total length of 30 kilometers (19 miles). Montecampione is best suited to intermediate skiers and snowboarders but there is some terrain for beginners and advanced skiers. We have no information about the existence of any cross country ski trails at Montecampione. The nearest airport is at Bergamo. Great location being near Bergamo airport. great views and surprisingly few queues at the lifts. Not expensive but a bit limited in that there are only 35kms. Monticolo is nearby as well as the spa town of Boario Terme .